В середине 1920-х - начале 1930-х годах большим успехом среди заказчиков пользовались учебно-тренировочные самолеты немецкой компании "Klemm". Одной из наиболее удачных моделей, созданных конструкторами данной компании, стал L.25, совершивший первый полет ДальшеMore>>> в 1927 году и отличавшийся достаточно высокой надежностью и хорошими летными качествами, необходимыми для машин его класса. Самолет был спроектирован на базе более раннего варианта L.20, в 1933 году британцы приобрели 27 таких машин, и примерно в то же время в Великобритании была образована компания "British Klemm Aeroplane Со." (Хэнворт, графство Мидлсекс), в задачу которой входила постройка этих машин уже на территории метрополии. Прототип британского варианта L.25 совершил первый полет в ноябре 1933 года, он отличался от базового самолета тем, что некоторые части его конструкции были усилены в соответствии с требованиями норм летной годности Великобритании. Самолет представлял собой свободнонесущий низкоплан деревянной конструкции с полотняной обшивкой рулевых поверхностей и имел складывающиеся крылья (это облегчало его базирование и хранение), две расположенные по схеме тандем открытые кабины пилотов, неубирающееся шасси с хвостовым костылем и хорошо зарекомендовавший себя двигатель малой тяги. Первые серийные машины получили обозначение British Klemm L.25C1A Swallow, причем прототип и пять первых серийных самолетов были оснащены звездообразным двигателем British Salmson A.D.9 мощностью 75 л. е., а остальные - за исключением одной машины - получили звездообразный двигатель Pobjoy Cataract II мощностью 85 л. с. После того как предприятие выпустило 28 самолетов в конструкцию L.25 Swallow внесли изменения: крыло, стабилизатор, киль и руль направления приобрели угловатые очертания, что по расчетам специалистов компании, должно было ускорить процесс постройки самолета. В этих же целях верхняя часть фюзеляжа была сделана более "грубой", потеряв свою гладкую вылизанную форму. Учитывая, что в то же самое время компания изменила свое название на "British Aircraft Manufacturing Со. ", модернизированный самолет получил обозначение British Aircraft Swallow 2. Было построено более 10 самолетов, оснащенных одним двигателем Cataract III или двигателем Blackburn Cirrus Minor 1 мощностью по 90 л. с. каждый. Часть из этих машин использовалась и в годы Второй мировой войны в качестве учебно-тренировочных в составе добровольческого Учебного авиакорпуса или в качестве "неофициальных" персональных самолетов командиров авиабаз британских ВВС. По имеющимся данным, в 1940 году британские ВВС реквизировали четыре самолета L.25, из которых три разобрали, превратив в учебные планеры, а один использовали как учебно-тренировочный самолет. 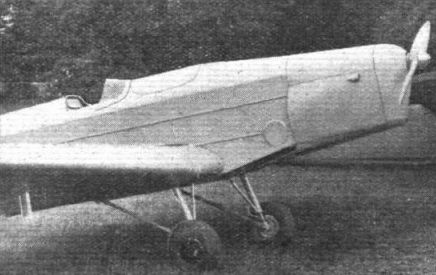 AS early as November 9, 1933, we were able to publish the first details of the two new British Klemm models being built at the works of the British Klemm Aeroplane Co., Ltd., Hanworth Aerodrome, Feltham, Middlesex. Since that date we have on several occasions visited the factory and watched the careful work which has been put into the first production machine. On Wednesday last, February 21, we were able to see the smaller of these two machines, the "Swallow," demonstrated, and to try it out for ourselves. It is an exceedingly pleasant aeroplane to fly, having in a marked degree that likeable characteristic which gives one the impression that the aeroplane is really making use of the air, and is, as it were, sitting on it, a characteristic which makes for sheer pleasure in flying as a sport, and is very different indeed from the feel of a more heavily loaded machine which has to be pulled through the air at a comparatively high speed to enable it to fly. The Klemm is lightly loaded, being, as it is, something under 7 lb./sq. ft. (34,2 kg./m2). It follows that the gliding and landing speeds are very low, and while it is true that a machine of this nature is peculiarly susceptible to vertical air currents, nevertheless they do not appear to affect it very adversely. Structurally the "Swallow" is not unlike its German prototype, but it has been generally strengthened up in accordance with British practice. The controls, although they are said not to have been altered very much, seem to be more effective than in the foreign machines, and this may perhaps be due to the better mechanical operation, obviating any possibilities of slackness and slop. The "Swallow" is, according to most British ideas, slightly under-ruddered, and a steep side-slip cannot be held if the speed is low. This, however, seems to us a praiseworthy fault, as the ham-fisted pilot generally gets himself into trouble by injurious use of the rudder. That is not to say that the rudder on the "Swallow" is of insufficient size for all normal use, it is not; even when taxying at slow speed on the ground there is ample control and for all normal requirements of manoeuvrability, it is perfectly adequate. 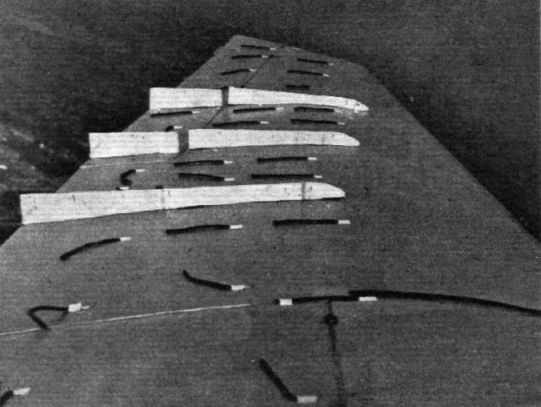 The controls are nicely harmonised, although the rudder, to our way of thinking, is inclined to be slightly too light, and in general are of the type which become progressively heavier as the speed increases. 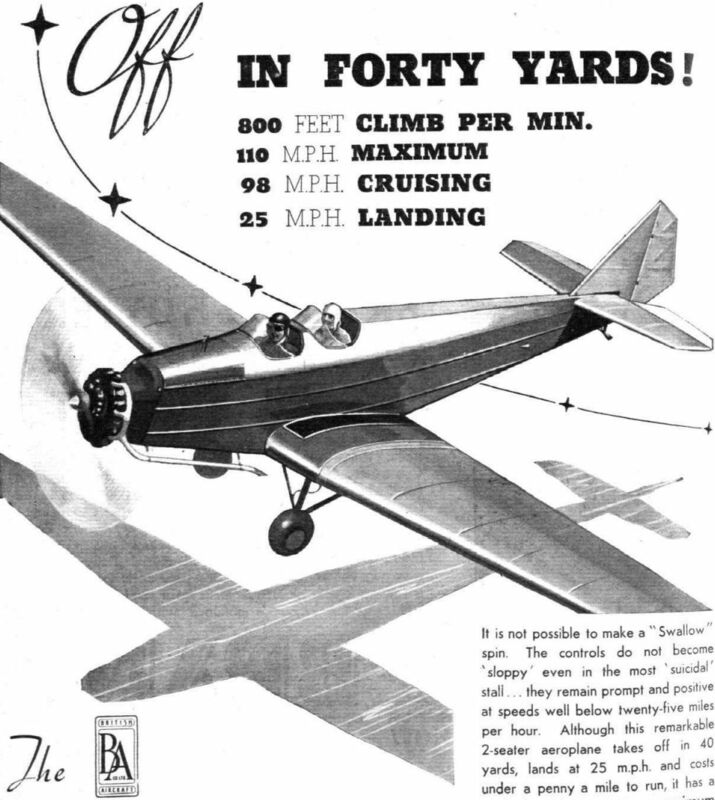 This is often criticised as a fault by those who consider things purely from a training point of view, but we feel that a machine which is primarily designed for the amateur pilot and for those who merely want to fly quietly about the country, ought not to have controls so balanced that they give little or no evidence of the speed of the machine. Naturally for supreme manoeuvrability controls of this type are possibly necessary, but for the man who does not want to be incessantly throwing his machine about, we do not feel that they are of any advantage at all. Put briefly, the controls of the "Swallow," while retaining their effectiveness right down to the moment of touching the ground, become sufficiently heavy at top speed to discourage people from using them too coarsely, and we cannot help agreeing with those people who think that this is a most valuable asset to this type of machine. The wing folding arrangement is both simple and efficient. 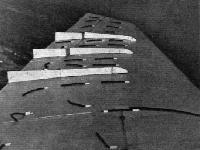 A lever withdraws both pins at once and a catch, riding up over an inclined plane fixed to the wing centre section snaps down into a slot, holding the wing in the open position until the operator releases it by means of a wire from the wing tip, thus allowing him to withdraw the pins; then coming to the wing tip, release the wing, and fold it himself. The machine we were privileged to fly was the private property of Lord Willoughby de Broke, and was the first production model. It had a 70/75 h.p. British Salmson engine driving a geared airscrew, while the exhaust was carried away beneath the machine through two long pipes. This exhaust system, coupled with the fact that the engine has nine small cylinders running at high speed, make it one of the sweetest little engines we have ever sat behind. Throttled back, by means of the Simmonds-Corsey control to 2,000 r.p.m., with the A.S.I, showing somewhere about 70 m.p.h. (112,6 km/h), it was quite possible to talk from one cockpit to another without the use of headphones. Even at the normal full speed of anything between 2,800 and 3,000 r.p.m. the noise is very much less than that in the majority of aeroplanes, and the lack of vibration was equally noticeable. We were not able to test the machine against a stop watch or obtain corrected figures in any way, but judging from the instruments in the cockpit we have no reason to believe that the figures in the table are other than slightly pessimistic. Besides this model there is also an exactly similar machine fitted with the Pobjoy engine. We have not yet had an opportunity of trying this ourselves, but we understand that the performance is, as one would expect with an increase of some 10 h.p., slightly better. Moreover the power weight ratio is quite a good deal better, and this in consequence gives the machine a better climb with this engine. Mr. Hordern gave a pretty demonstration of quick take-off, steep climb and slow landing. With the new Pobjoy "Niagara" of 90 h.p., the performance should, of course, be even better. In both machines the instruments, supplied by Smith's, are conveniently grouped on the dashboard and adequate in number. Despite the top fuselage fairing and the fact that the dashboard is well underneath it, there is ample light, and under no circumstances is there any difficulty in seeing the instruments, a matter which is not always so simple on some machines. One point which we feel justified in criticising, though small, is important from the point of view of flying comfort, and that is, that tail trimming gear of the rubber cord elevator loading type is used. This gives an entirely false feel to the controls, which is liable to be disconcerting to the inexperienced pilot. No doubt an adjustable tail plane is a somewhat more expensive fitting than elevator loading, but it is surely a provision which we are now entitled to expect on machines of the class of the British Klemm. The demonstration on Wednesday was given by Mr. E. G. Hordern, the firm's test pilot, and most effectively showed off the essential features of a lightly loaded machine, including low gliding and landing speeds, a short run and good take-off. The equipment offered with the machine is sufficiently comprehensive for all normal use, and includes items like a Kigass primer for the engine, telephone tubes, and compass, which are often not standard. Besides Lord Willoughby de Broke, the chairman of the company, Maj. H. Musker, Maj. E. F. Stephen and the other directors were there to welcome their guests, and they did everything possible for them, answering all manner of questions and lending their machines to anyone who wished to fly them. After spending some time on the aerodrome we were taken round the works by that old pioneer, Mr. George Handasyde, who is in charge of the works, with Mr. H. B. Boultbee under him as designer. There we saw several more "Swallows" ready for shipment to Mombasa, Australia, and other parts of the world, besides which there was the very interesting air frame of the "Eagle" (described in FLIGHT for November 9, 1933) in a fairly advanced state, and we hope to have more to say about this machine next month. When we left, Lord and Lady Willoughby de Broke were getting ready to fly back to their place at Kineton, Warwickshire, where they have their own aerodrome, and incidentally Lady Willoughby de Broke has now learned to fly the machine herself; in it she accompanies her husband to Meets, as he is a joint M.F.H. NOW that several flying clubs have adopted the B.A. Swallow as a trainer, this interesting little machine may be said to be coming fully into its own. Not that its value lies solely in the fact that it is one of the safest and easiest machines to fly; its performance at the top end of the scale is extraordinarily good when the comparatively low power and extremely low landing speed are remembered. Furthermore, its cruising range is of the order required for Continental touring. A small gravity tank is fed by pump from the main tanks, and the total fuel supply suffices, for 4 1/2 hours' flying. 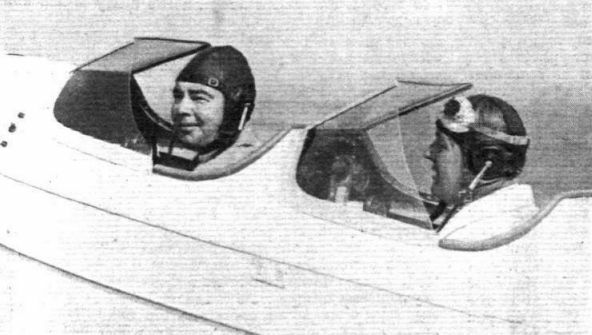 With a cockpit starter it is possible, at a safe height, to stop the Pobjoy radial altogether and to soar about the sky with no sound other than the faint whistle of the wind, and the cockpits are so well-screened that it is a pleasure to fly without helmet or goggles. 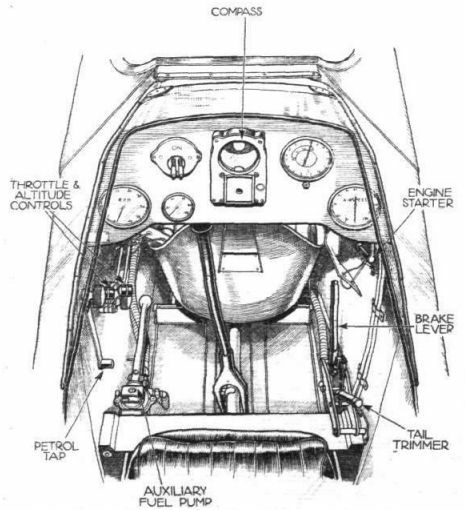 The handling qualities, though not quite perfect in the matter of control harmonisation, are excellent in their absence of vice, and the pilot can hold the stick right back and apply full rudder with no worse results than a spiral. Consequently, the Swallow can be held at or near the stall with perfect safety while making a short approach, provided that the nose is dipped at the last in order to obtain full control for the landing. One or two amateur pilots who have been unable to "solo" safely on other machines have been passed out on the Swallow - a fact which speaks for itself. 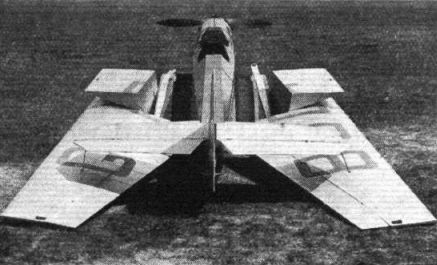 The specification of the Pobjoy-Swallow is as follows: Span folded, 15ft. 1in; length, 27ft. ; weight empty, 930 lb. ; disposable load, 570 lb. ; maximum speed, 112 m.p.h. ; cruising speed, 98 m.p.h. ; landing speed, 30 m.p.h. ; initial rate of climb, 800 ft./min. ; endurance at cruising speed, 4.5 hr. Price, ?725. Although the passenger in this view is actually wearing goggles the screens of the new "Swallow" permit comfortable flying without them. Fit. Lt. J. B. Wilson, the makers' chief test pilot, is piloting the machine. Изображенный на снимке самолет, G-ADDB, строился как Swallow, но в мае 1935 года появился уже в модернизированном виде, как прототип модификации Swallow 2. Одна из основных задач модернизации заключалась в сокращении сроков постройки машины. British Aircraft type, the Pobjoy-engined Swallow. 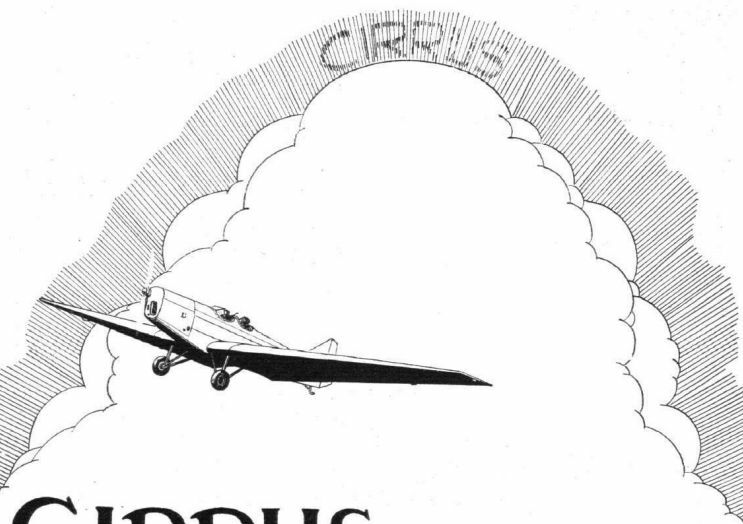 The Swallow is, of course, available with the Cirrus Minor engine. 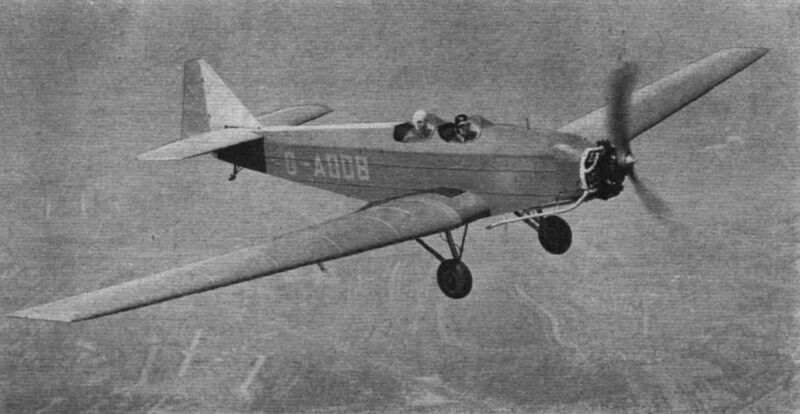 Best known of the British Aircraft range, the Swallow has made an enviable reputation for itself both as a trainer and a private owner's machine. It may be fitted either with a Pobjoy or a Cirrus engine. In its new form the "Swallow" has attractive, if relatively austere, lines, while retaining the distinctive appearance of the type. 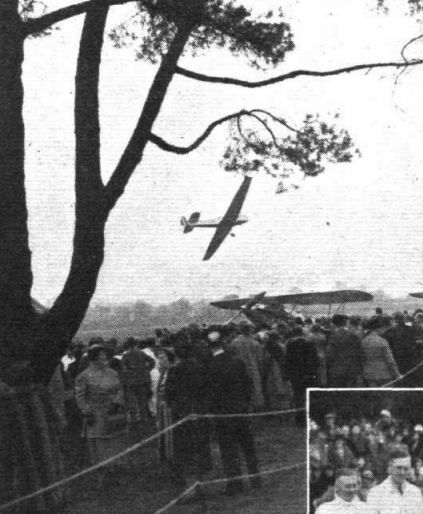 BUSINESS BACKING: At the official opening party of the Midland Bank Flying Club. A general view of the proceedings - with one of the Club's two B.A. Swallows in the air, and, on the ground, one of the three Demons of No. 600 (F) Sqd. A.A.F. which put up a display during the afternoon. Straight lines lend an air of distinction to this new two-seater B.A. "Swallow," which, as described below, has a remarkable speed range. Not a new type of Autogiro, but an amusing juxtaposition with the new B.A. 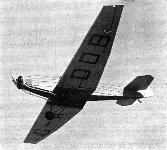 "Swallow"; incidentally, the "Swallow" displayed almost Autogiro-like slow-flying capabilities. Open and closed. The one of two B.A. machines is the Swallow. ONE SWALLOW...: This B.A. Swallow (Pobjoy Cataract II), owned by Mr. E. Newbold of the Penang Flying Club, was actually the first and is still the only private machine in Penang. LULL IN THE STORM: Varied fauna at the Bristol club's garden party last Saturday, which suffered severely from the weather. Seen here are one of the Club Swallows, the Bristol 143, an Autogiro, a Drone, and three Harts of No. 501 (City of Bristol) Squadron. The human element is mainly seeking solace in the clubhouse, which, with the Airwork hangar, can be seen in the background. PENANG'S FLYING CLUB. - The fleet consists of a B.A. "Eagle," a B.A. 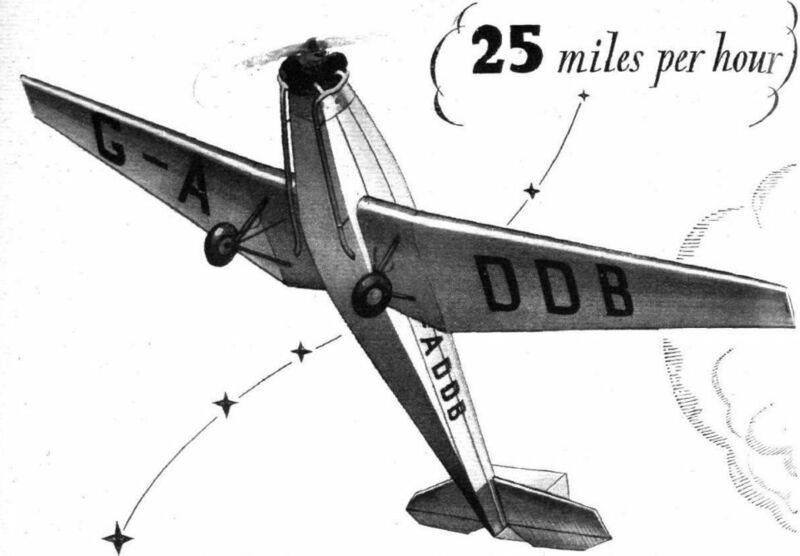 "Swallow" (Pobjoy) and three D.H. "Moth Majors." PUSHING THE BOAT OUT: Mr. Hore-Belisha launched a new cruiser last week at Devonport, after arriving in a B.A. Swallow from Wilmington via an unrestricted area. The Swallow must have inspired a particular feeling of confidence, because it can be throttled back safely to round about the desired 30 m.p.h. Mr. Hore-Belisha intends to learn to fly himself. 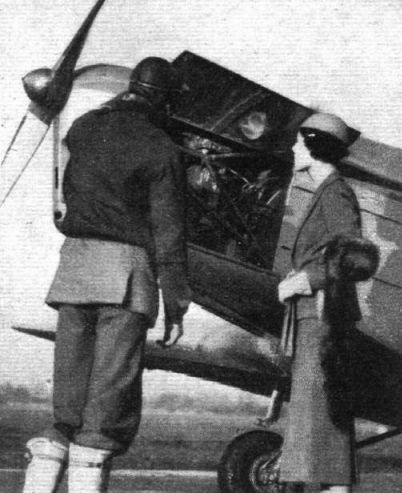 The Instructor of the Bristol and Wessex Aero Club and a lady pupil interested in the CIRRUS MINOR fitted to their latest acquisition, a B.A. "Swallow." Fig. 3: The Swallow, with fins to prevent bending of the surface layer flow. Fig. 6 (left): A "shallow" stall on the B.A. Swallow, with the wing yawed forward 5 deg. Fig. 7: A "deep" stall with the wing yawed back 10 deg. Since the inner walls of the new "Swallow" cockpits are ply-covered the interior is particularly tidy. The neat grouping of the instruments, including the compass, is noteworthy. 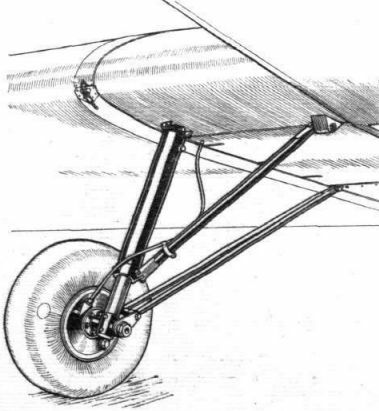 The major modification to the undercarriage, by which the radius arms are now attached to the moving portion of the leg, is clearly shown in this sketch.